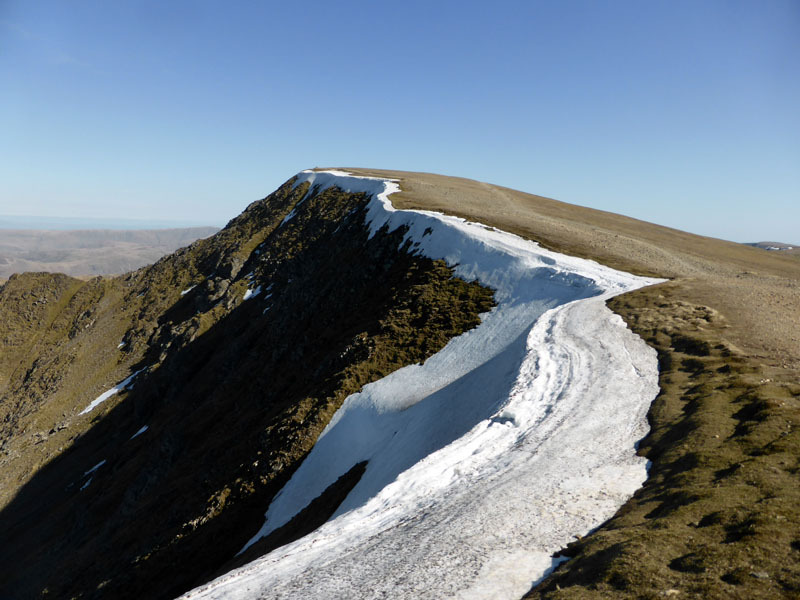 It's just five months since we were last on top of Helvellyn, but today is in much better shape than that grey November day. 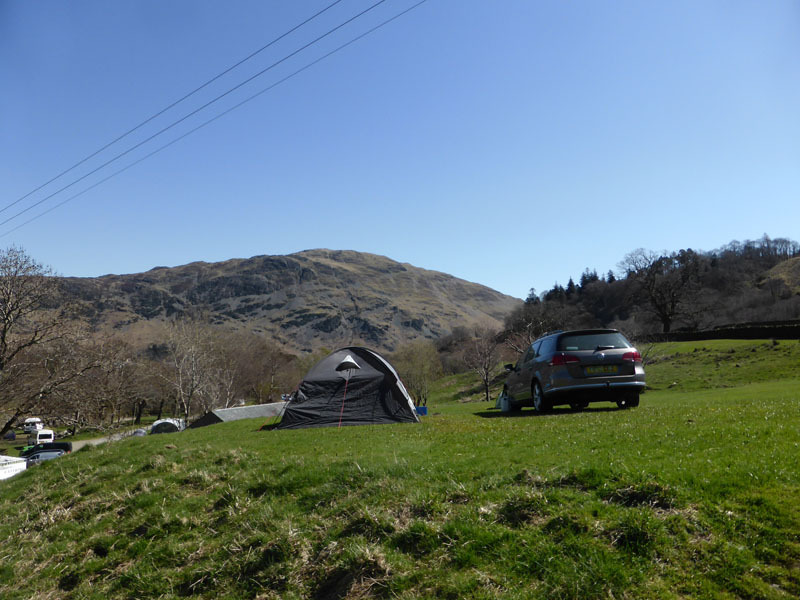 We left home on Saturday morning and pitched the tent at Gillside Farm, Glenridding. The walk started at 12:30hrs from the campsite. 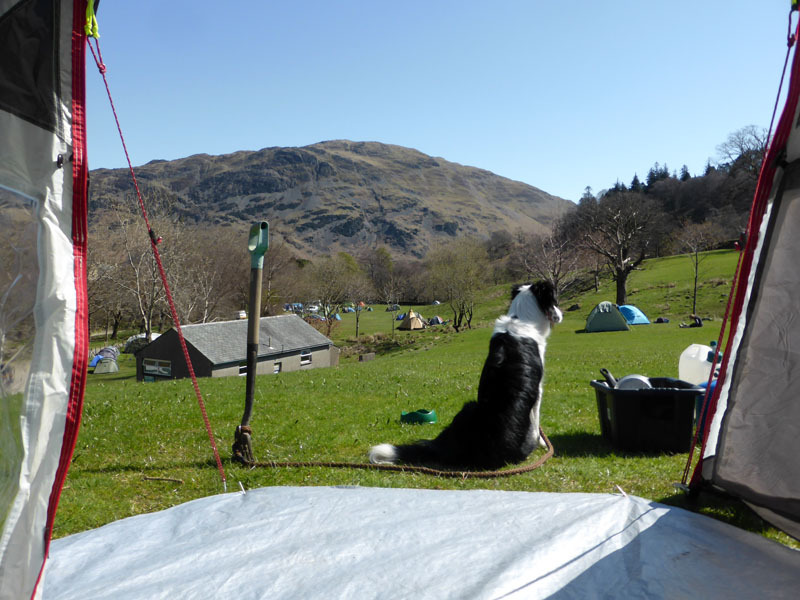 The upper field at Gillside Farm offers a great view of proceedings, the garden fork is very handy to tie Molly up and would also allow me to help with any groundworks required during our stay. I have a "new" car - VW Passat Estate with lots of gadgets and stuff. What a bootiful day! 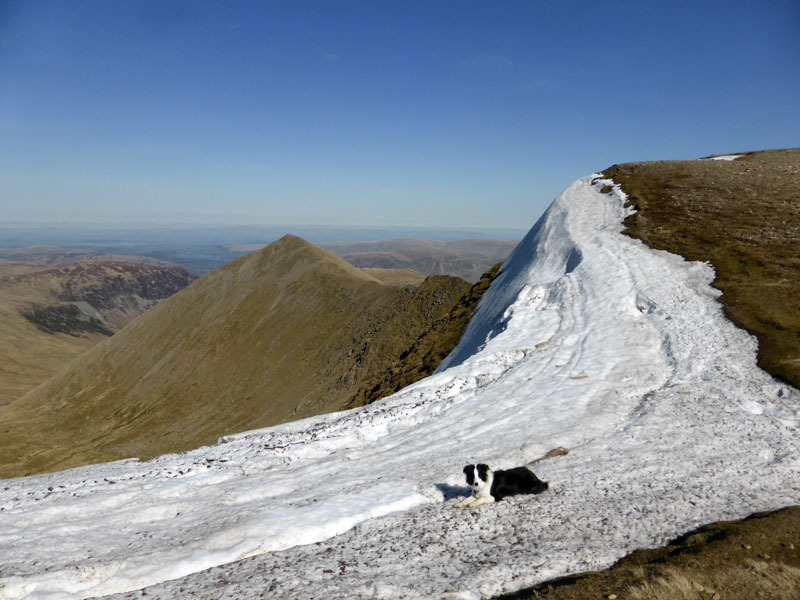 Every man and his dog are out today - three New Zealanders believe they are on the right route to reach Striding Edge on the "Hole-in-the-Wall" climb up Birkhouse Moor. Still, all was not lost and I directed them up the "Red Tarn Outflow" path, my names for these routes but fairly accurately described, I think. 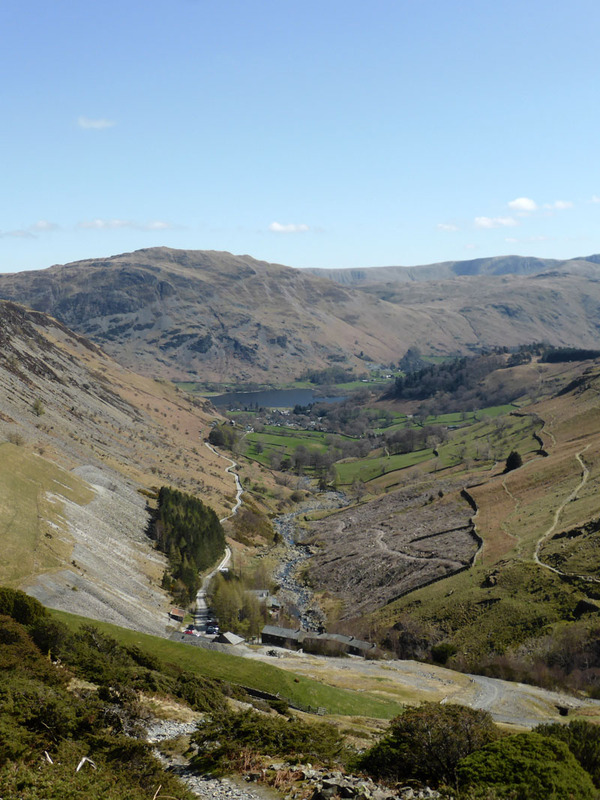 We are going to head up Sticks Pass which runs close to Swart Beck - supplying water to the mines and now simply a tributary for Glenridding Beck. 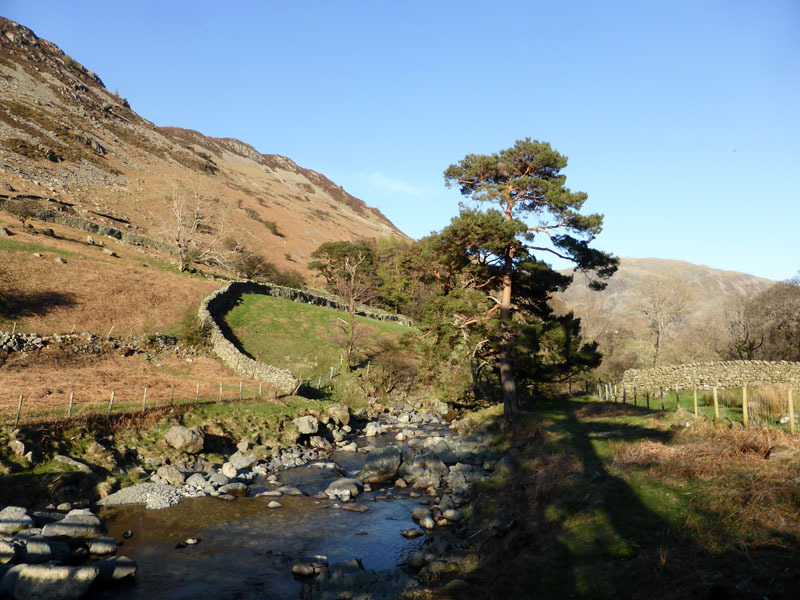 The wood on this side of Glenridding Beck has been felled since my last walk up this way. 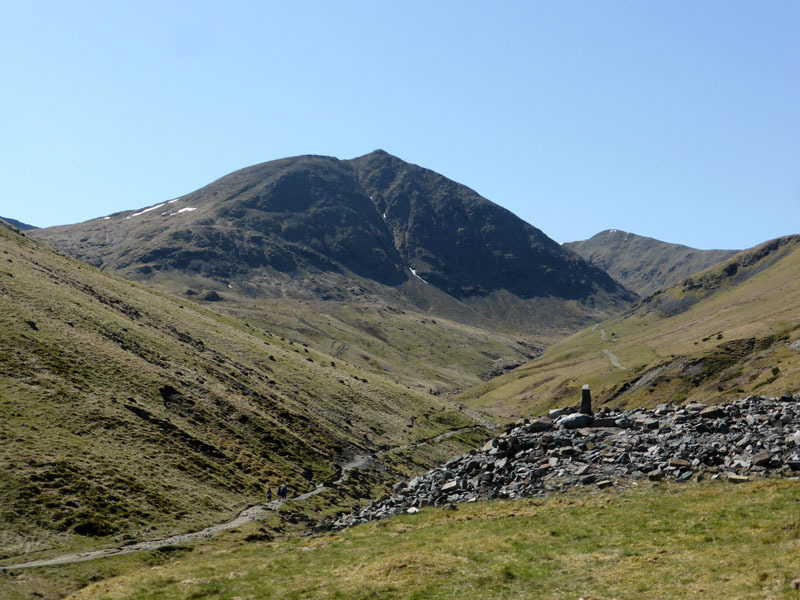 Catstycam is the mountain with shadowy cliffs. 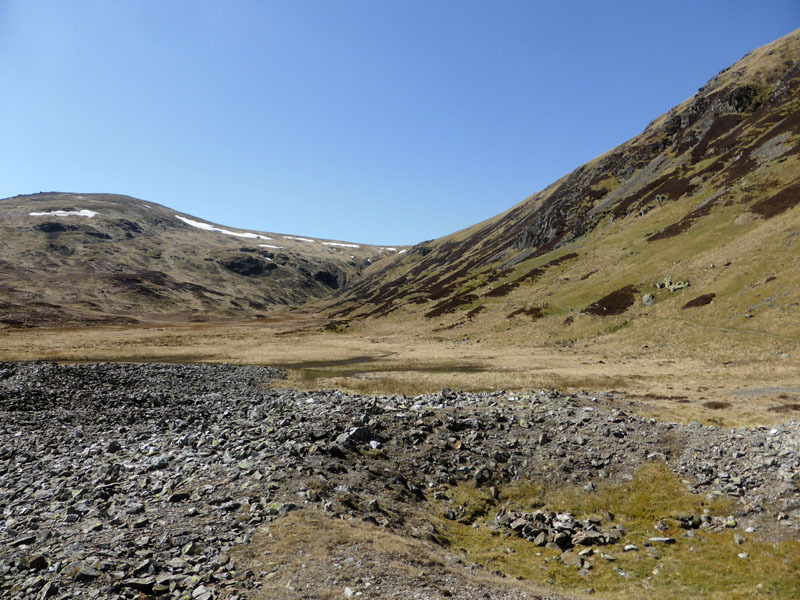 The Kiwis are now following the path which will lead to Red Tarn. 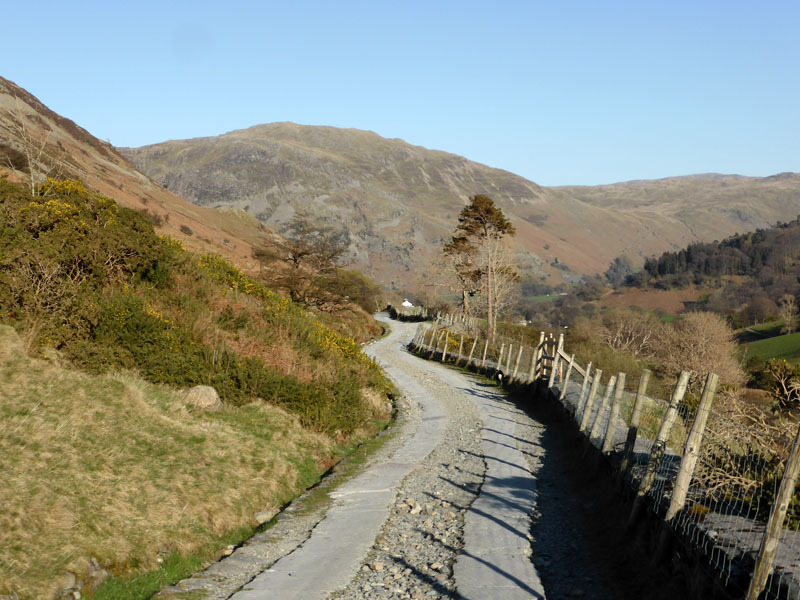 Sticks Pass is a high level route between Ullswater and Thirlmere, highest point of approx 2,450ft above sea level bewteen Stybarrow Dodd and Raise. 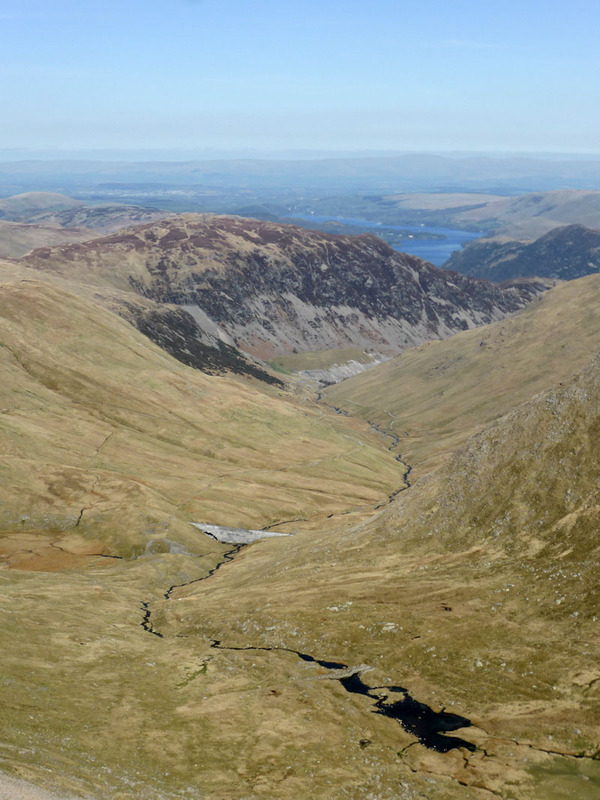 The photo looking down Glenridding Beck shows where the trees have been felled, revealing a now-superfluous forest track. 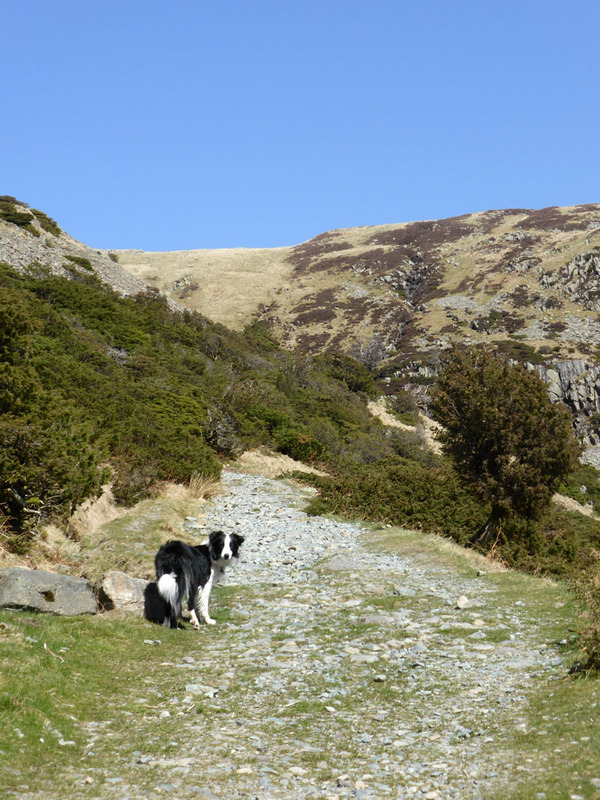 Looking up to Sticks Gill (left) and back down a little later on. Come here for a little peace and quiet. 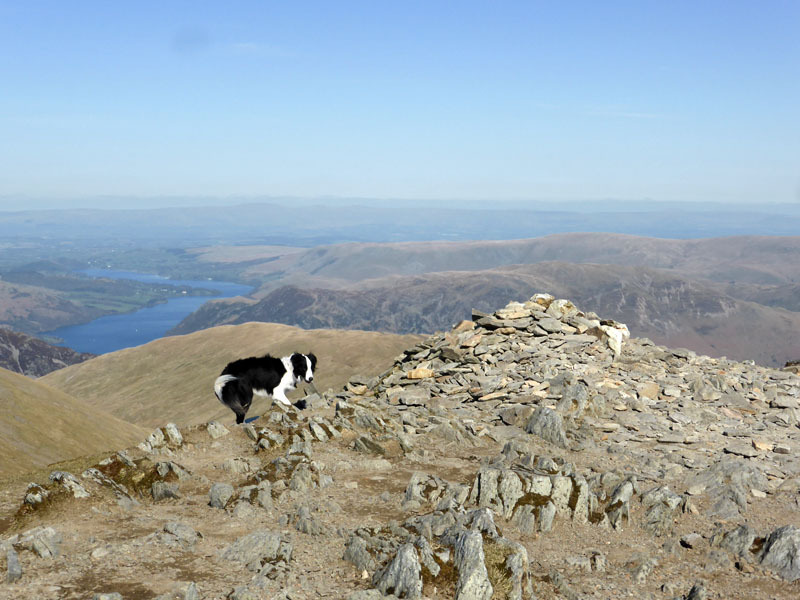 We aimed for the top of the pass before veering right up a gill and trudging across the grassy slopes to reach the higher reaches of Stybarrow Dodd. 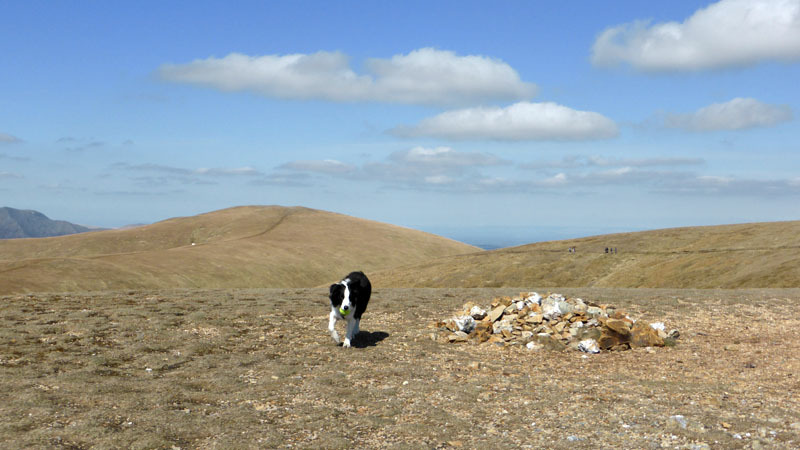 I was wearing shorts and a t-shirt and passed others with coats and long trousers, perhaps it was cooler up on the tops. 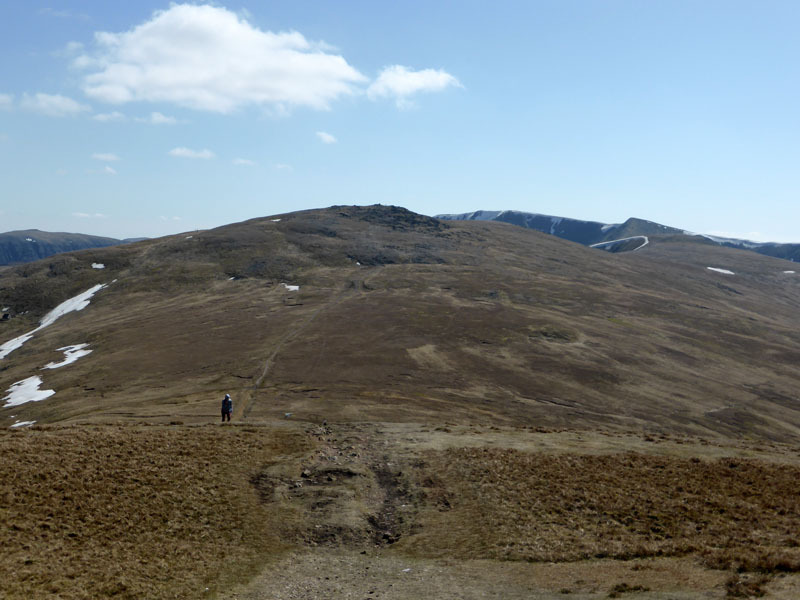 Great Dodd is further away. Fleece on now in the cool northerly breeze, but no need for the coat, which is just aswell as it is in the tent. 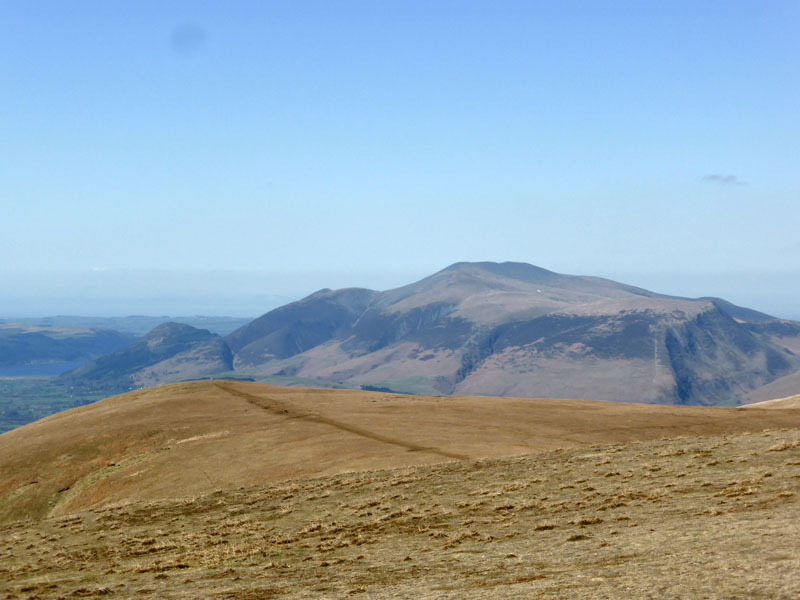 In a land full of "Dodds", here is another one with the fine prospect of Skiddaw dominating the view. 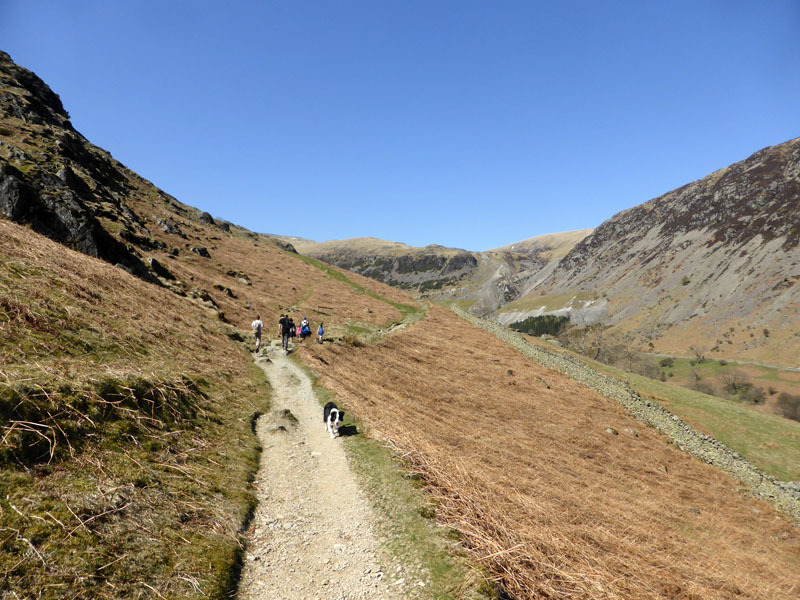 Ups and Downs now on the way to Helvellyn. First up is Raise and a special cheer for Molly as she continues her quest to beat me to the top of any mountain we climb. 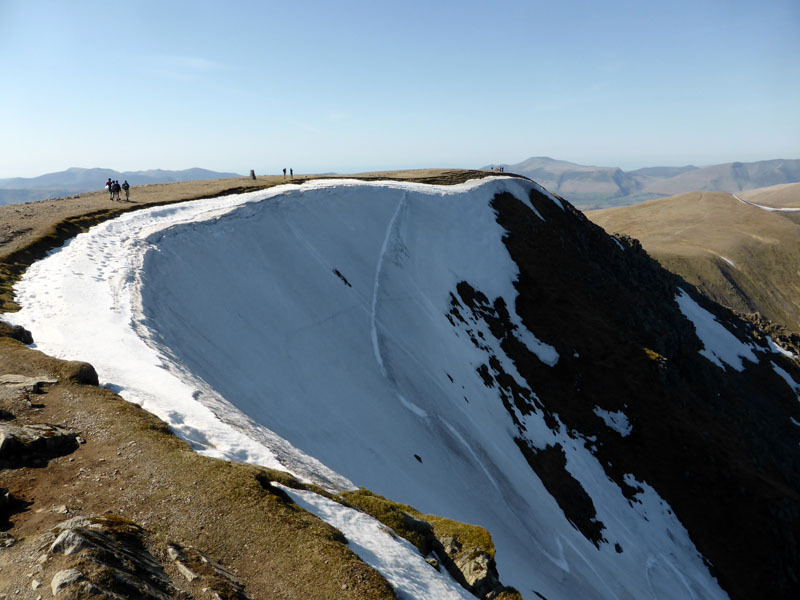 There is the small matter of another 450ft of ascent on the way to Helvellyn Lower Man. 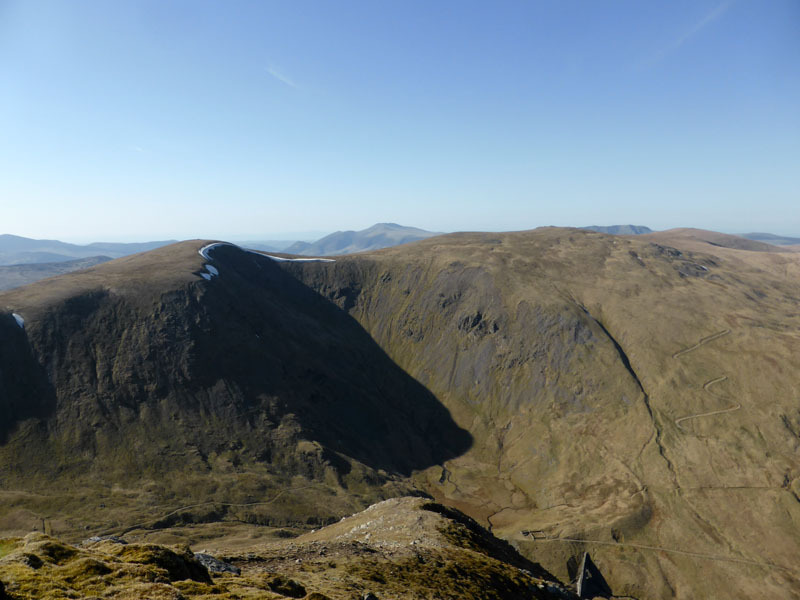 I'm sure many fine words have been written about the fell that we call "White Side", it's not one of my favourites and won't add to them. 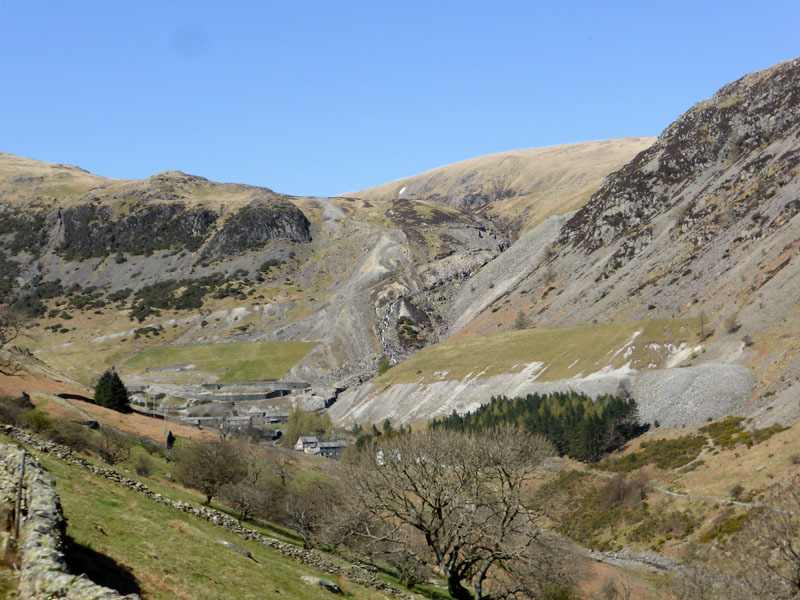 The view down to Keppel Cove Dam, another industrial relic related to the Greenside Mines. Ullswater is in the distance. 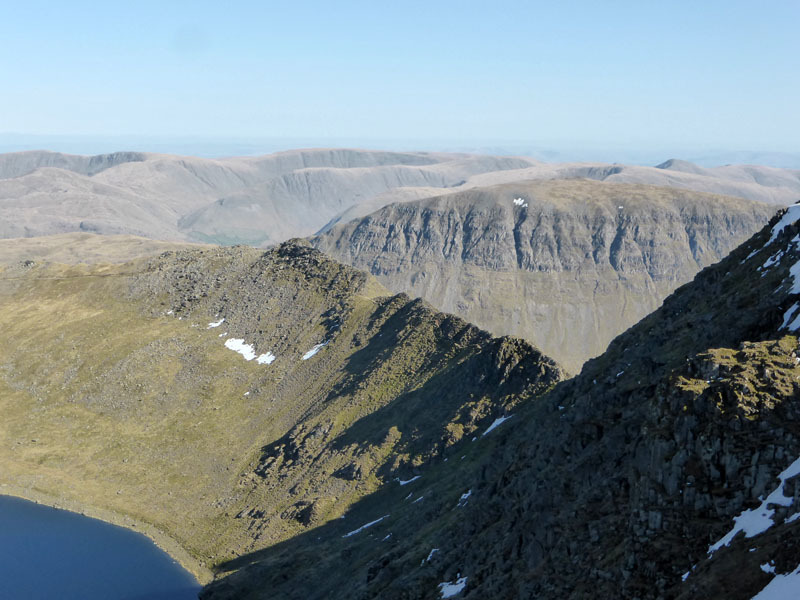 We will be choosing between a descent route of either Swirral Edge or Striding Edge, it might come down to the toss of a coin. 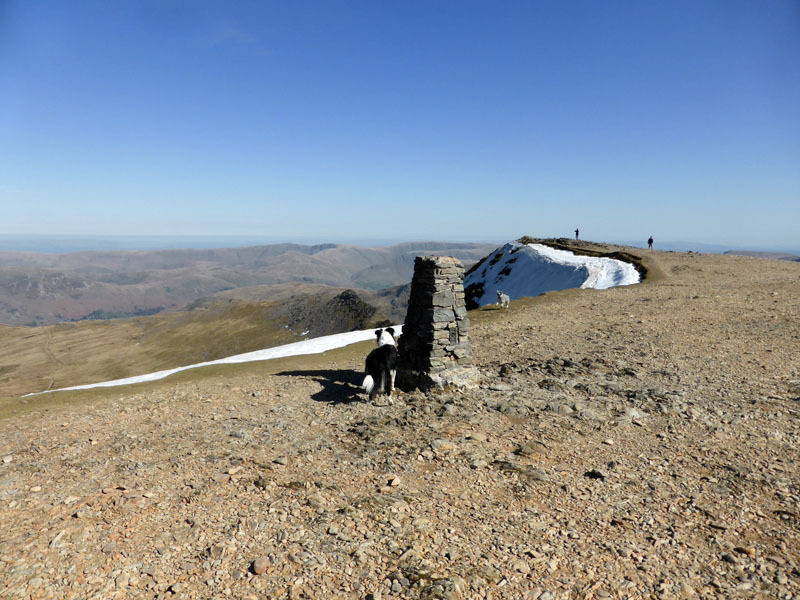 Here we are on the subsidiary summit with a good view to Helvellyn itself. 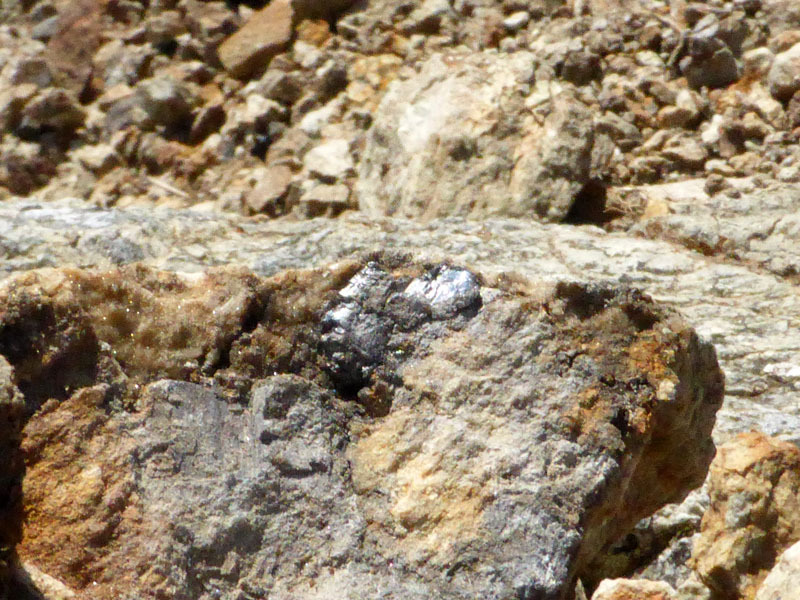 Venture onto the decaying cornice at your own risk! 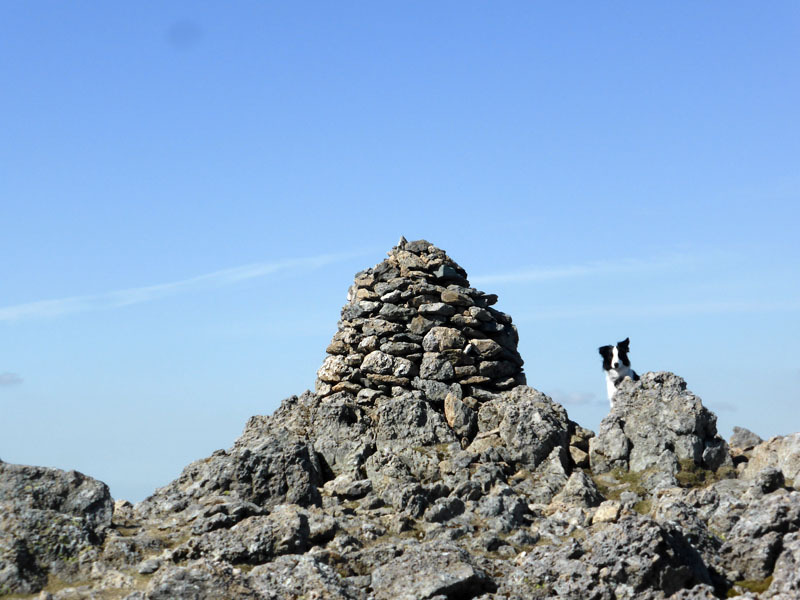 The header photo shows Molly on the edge, her 16kg was unlikely to cause much drama. 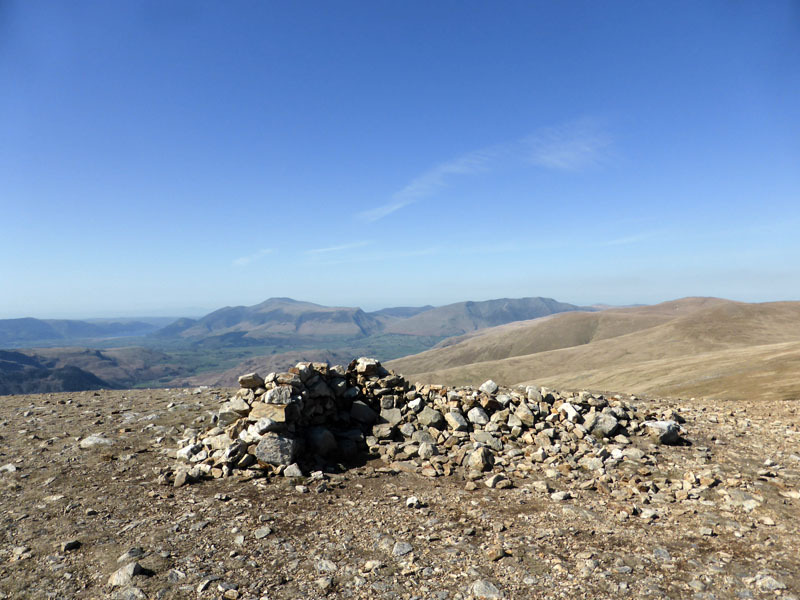 The Trig Point is a famous landmark up here, and rightly so - thousands of folk stand and smile next to the column; Selfie Central as far as these Eastern Fells are concerned. 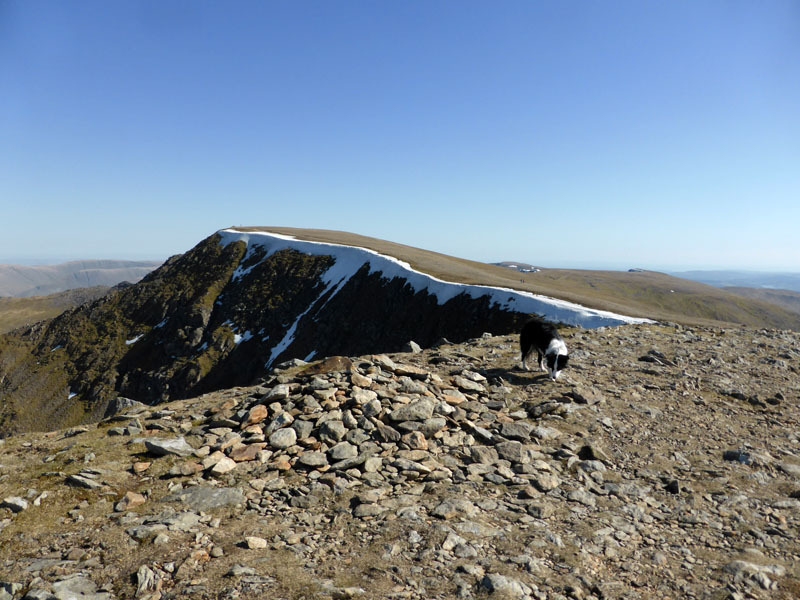 Fewer walkers take the trouble to do the same at the summit (right). 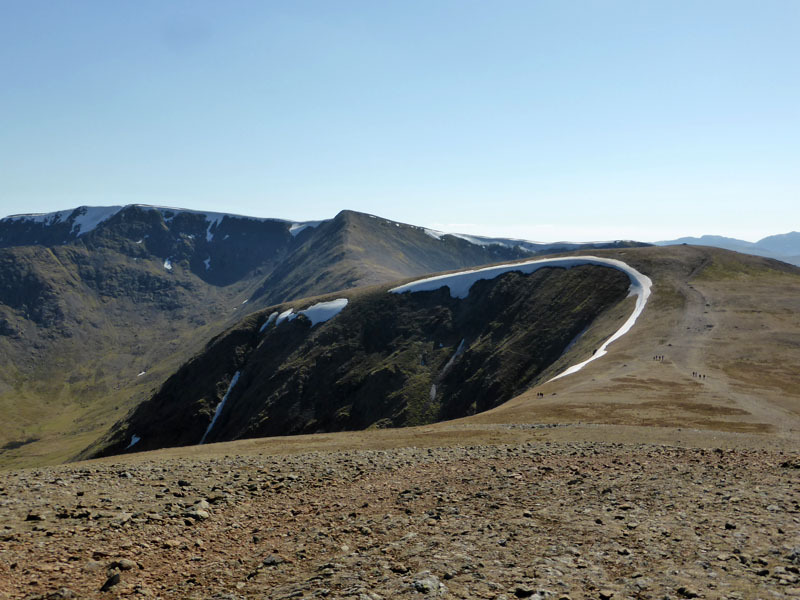 There must be at least 50 different ways of reaching Helvellyn summit from valley starting points - now there's a project for a book! Although I bet someone has already written it and somebody else will have revised it with nice photos and a glossy cover. 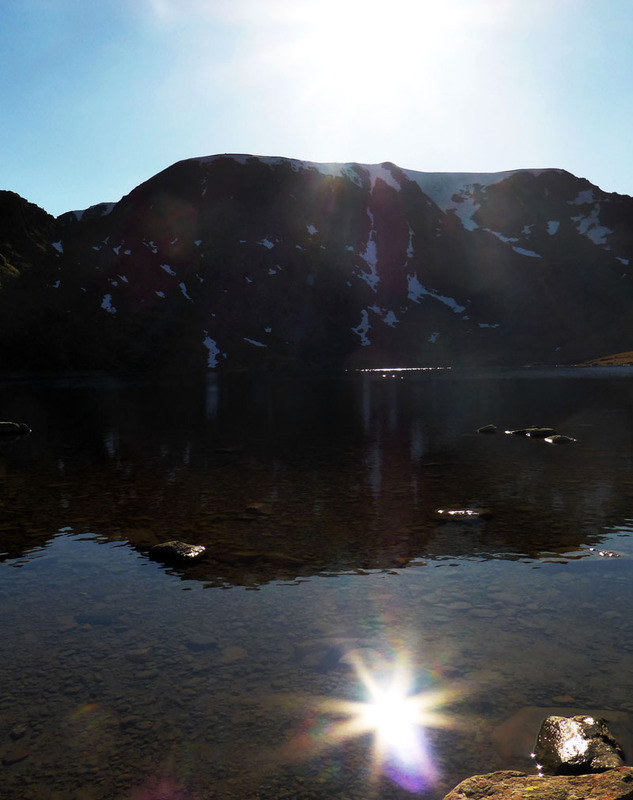 There is a quick way down to Red Tarn. A website reader advises me that there is a YouTube video of a skier on this run, filmed by a drone. Such drone activity is in contravention of the CAA rules and I hope it stops soon, otherwise there will be loads of them up in the air ruining the enjoyment of others. Hence no link on here from me. 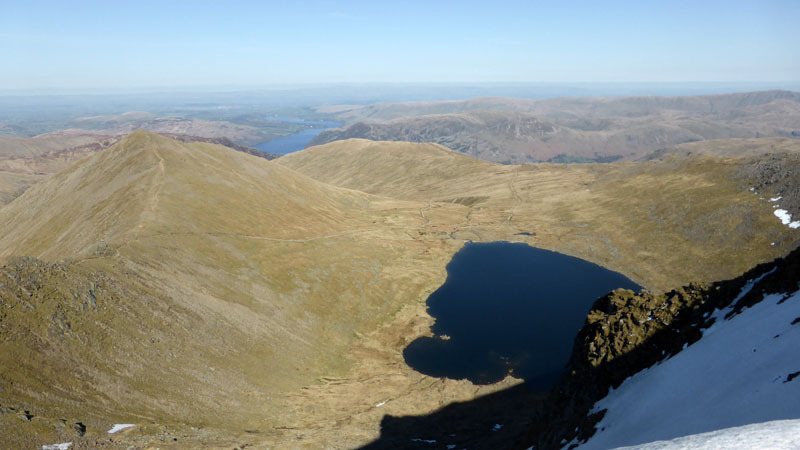 The tarn is looking towards Swirral Edge, perhaps we should go that way. 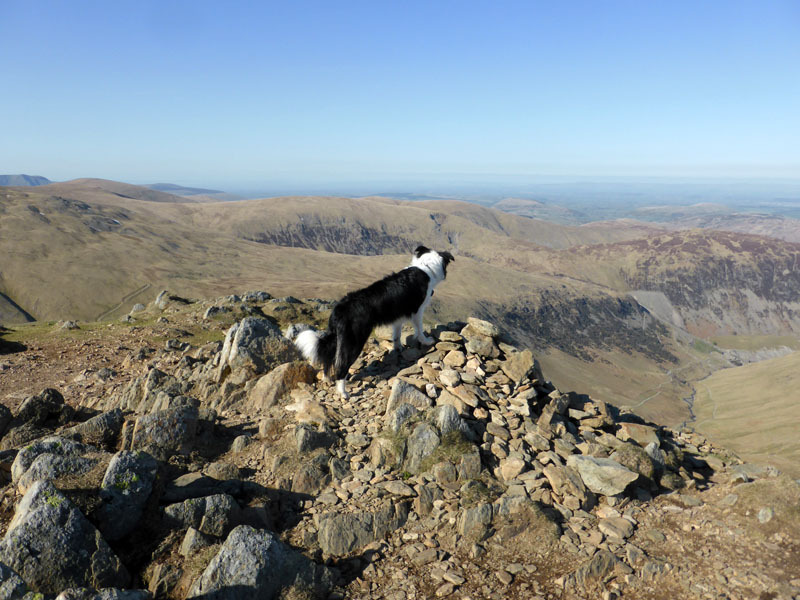 Swirral Edge is certainly a less demanding route than Striding Edge and Molly is a little nervous about descending on steep scrambles. We had a few "Scooby" moments when she jumped into my arms on the way down. 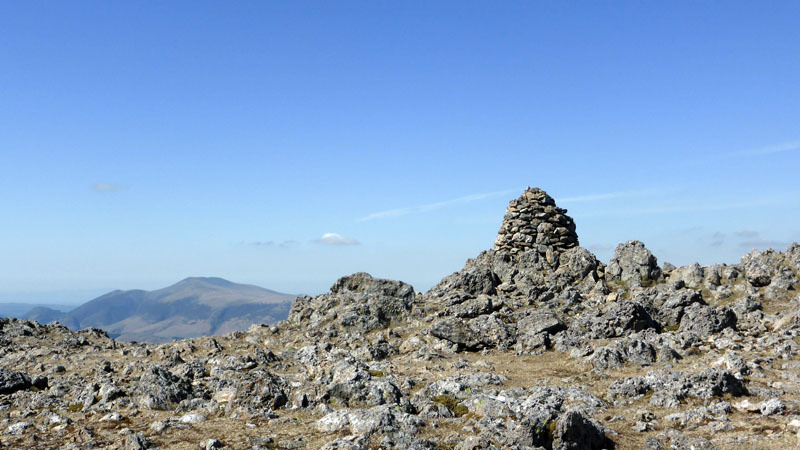 The summit of Catstycam lies directly ahead; sometimes I wander over to the top and sometimes I don't - you can't really claim to have climbed another mountain, can you? 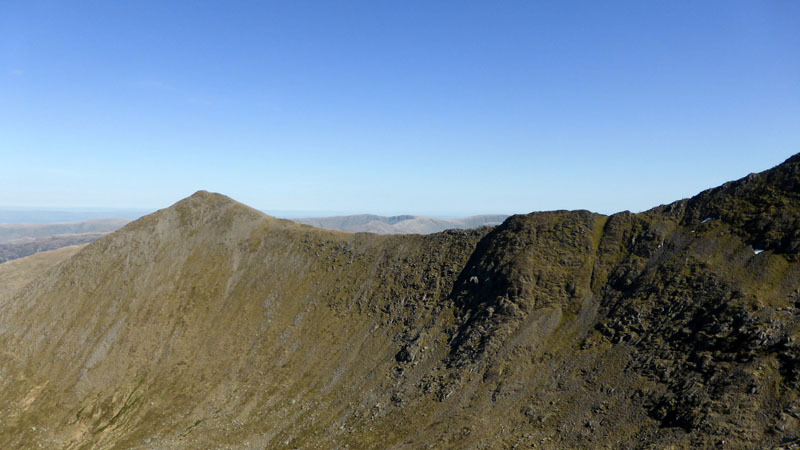 That's Striding Edge in the middle of the photo, with the gullies of St.Sunday Crag further away. 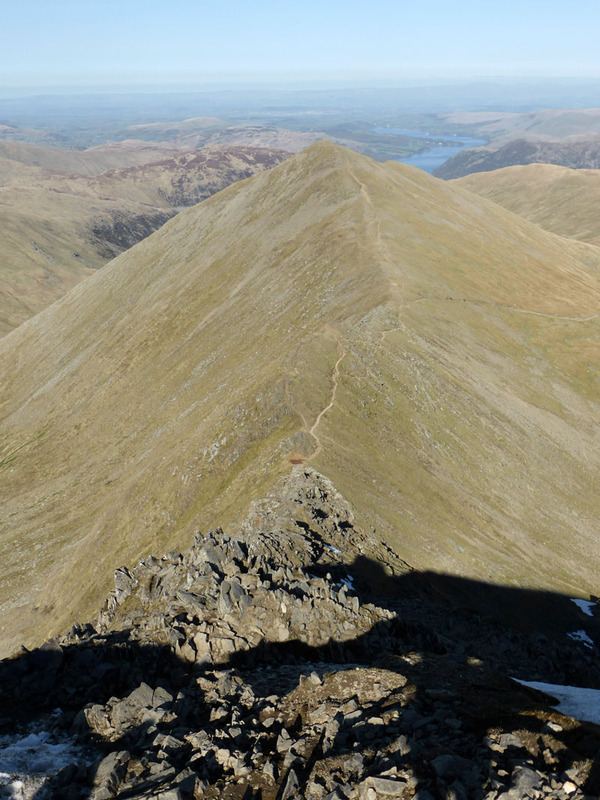 ... casts a deep shadow as seen from here, the top of Catstycam. 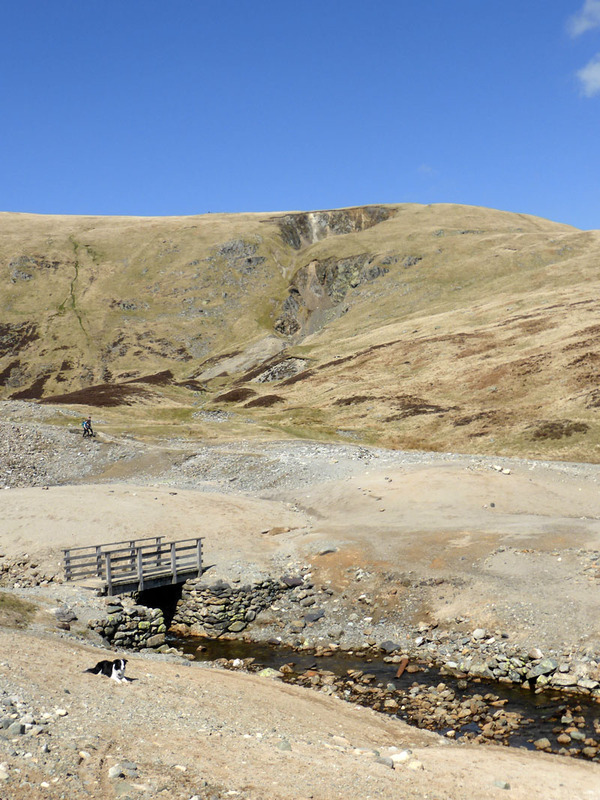 Keppel Cove dam is at the foot of the steep descent from this point. 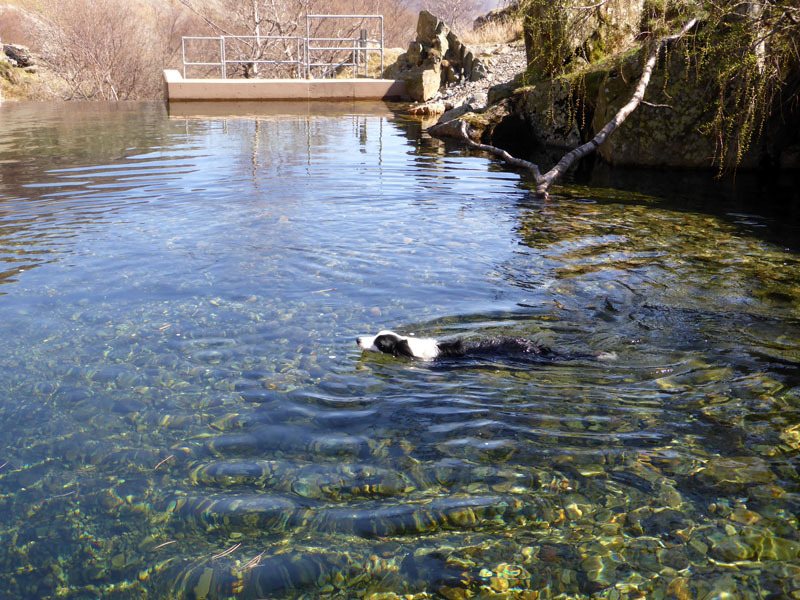 Molly surveys the route down to Glenridding Beck. 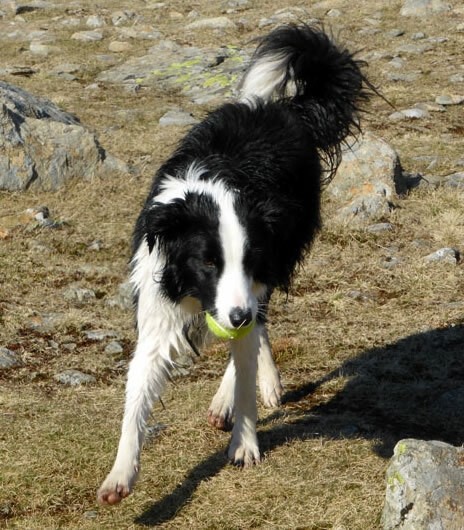 Down at the tarn and time for a bit of ball fun. 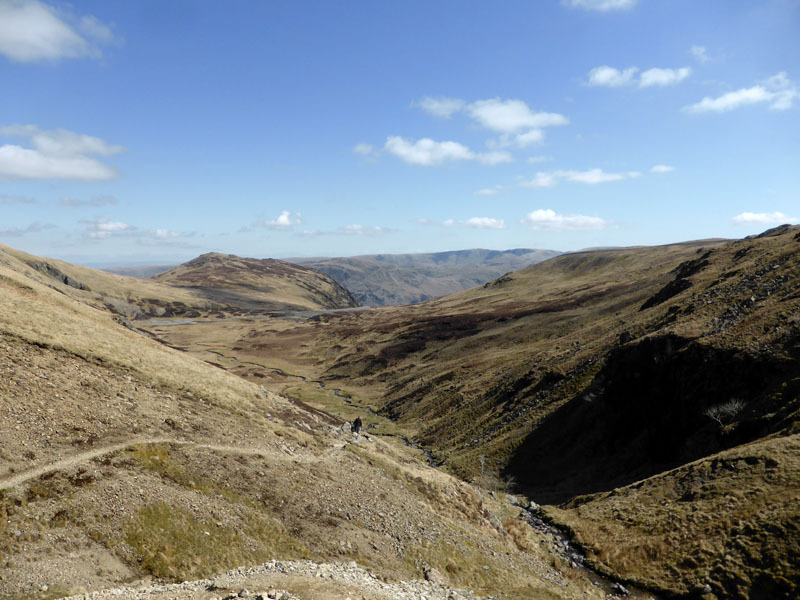 My feet and legs tend to prefer ascent to descent nowadays, or is it just weary legs? 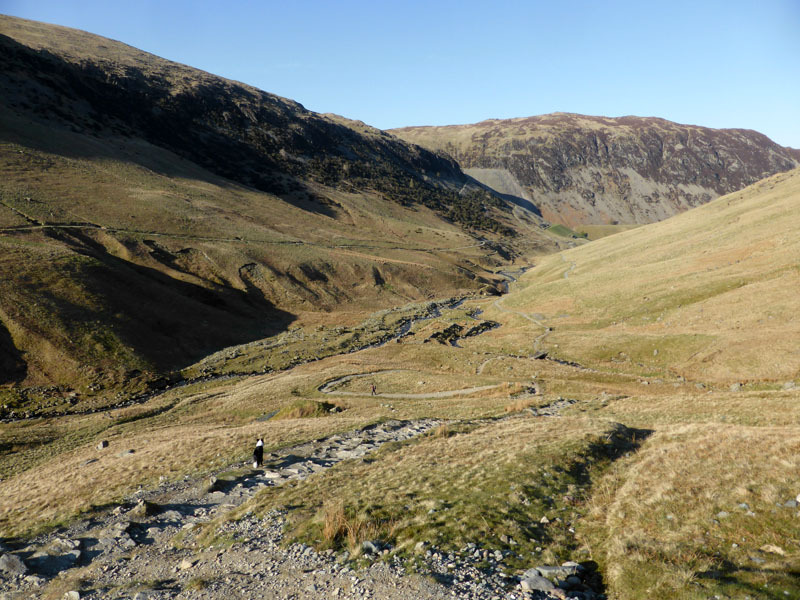 It really was a great walk in superb conditions. Time taken: 6hrs over a distance of about 12 miles. 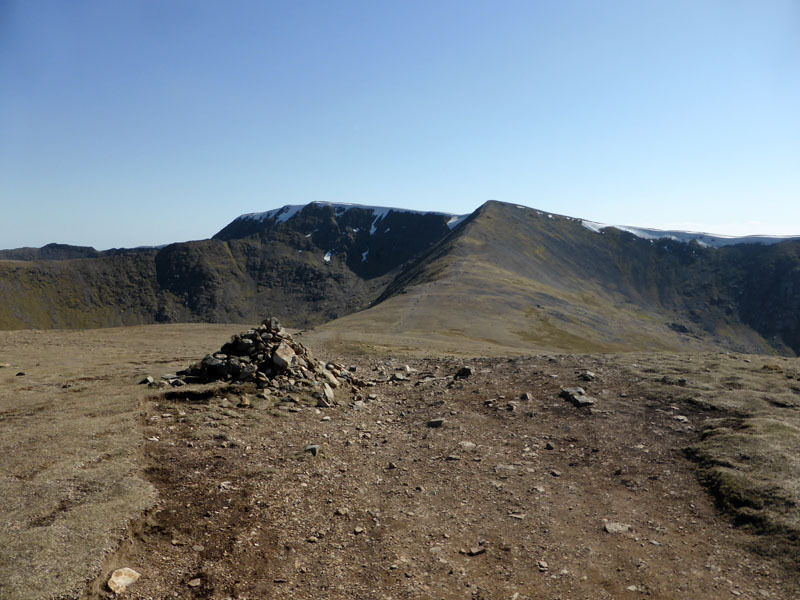 Starting at this hiley unusual time led to a quieter scene on the top of Helvellyn and no dwell time at the end, it was straight to the pub. Route: Gillside Farm, fellside route to Greenside mines, Sticks Pass to Stybarrow Dodd, Raise, White Side, Helvellyn Lower Man, Helvellyn, Swirral Edge, Catstycam, Red Tarn, Outflow route to Greenside and the vehicular access route back to Gillside - taking the diversion across the fields just before Glenridding. Weather: Coolish, dry and sunny. Chilly at times on the tops. Refreshments: At the Travellers Rest in the evening. Good food and real ales, nice folk .. what more could you wish for? Some might say "a seat", so get there early to avoid sitting outside when you'd rather be inside. We got the last spot inside!